No signal or no connectivity is a big problem for cell phones. Users want to be able to use the most basic function of a cell phone – making calls – whenever they want to. While certain areas have connectivity problems, which we can hardly do anything about, some phones begin showing no signal even though the network is available. This is a problem which is related to the phone and we cannot blame the network in this case. Some of our readers, especially Samsung users have often complained of no signal problems on their phones. They try to make a call and find out that there is no signal at all or they get a pop-up box that says ‘Not registered on network’. These problems can be dealt with when they are very rare and do not last long, but if this happens very frequently, it can become extremely annoying for the users. Before you start troubleshooting the problem on your phone, it is advisable to check if the SIM works fine on another device. You can use a friend’s phone or any other smartphone or tablet in the family. This will help you figure out whether the problem lies in the network or in the phone. If the SIM behaves properly and you are able to make and receive calls and send messages without any problems from another device, then the problem lies in the device that you are using. Otherwise, you may want to contact the SIM provider if the SIM does not work on another phone either. This is a crucial step to help you understand if the problem lies with the phone or not. Once we start troubleshooting the phone, it is pointless to identify the network as a problem after numerous steps. Once the phone is identified as the problem maker, the issue can then be either in the software of the phone or in the hardware. However, here are the possible solutions to fix this issue. The best and most helpful solution for this problem is to restart the device. Once you restart the device, it refreshes the system and the device looks for network all over again. It is usually helpful, albeit the problem may be fixed only temporarily and it may reoccur at a later time. For people who do not face this problem very often, a restart can be a quick and easy solution. Many readers found this to be a helpful solution and it helps in solving the problem quickly. 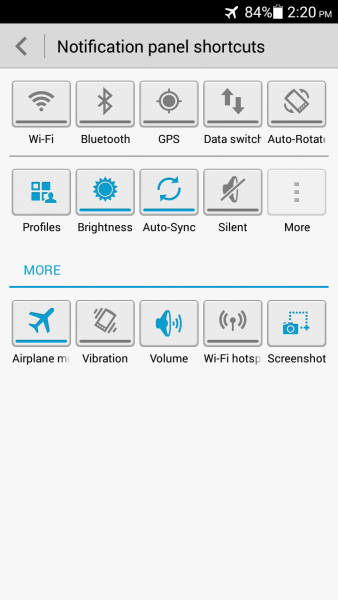 To toggle the Airplane mode, pull down the notifications shade of your phone and look for the icon of Airplane mode. Tap on the icon to switch the mode on. Wait for 30 seconds and tap on the icon again to switch the mode off. Once your phone comes out of the Airplane mode, it will try and search for the networks again. Sometimes, when the SIM card is not inserted properly, you may find a problem of no signal or an error showing up on your screen. To resolve this problem, power off your phone and remove the SIM card. Now reinsert the card and make sure that it is inserted properly. If it feels that the SIM card is moving within the metal bracket then there is a possibility that the movement causes the connection to be lost and you get a no signal problem. If you find the SIM to be moving a lot, take the phone to the manufacturer to check if something can be done and if the phone is under warranty, if a replacement can be arranged. You can also try and use a piece of paper on top of the SIM to hold it securely in its place. 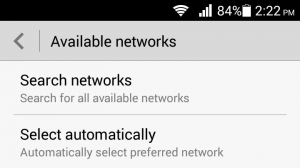 The device will start looking for networks automatically and it will try to connect to the network once it identifies one. This should help you solve the problem. Open the dialer of your phone and type *#*#4636#*#* .Dial this number and wait for the results. You will get a testing menu on your device screen. Click on phone/device information from this menu. Run the ping test and then select GSM Auto (PRL) from the drop down list. Once this step is completed, restart your phone and check if you are now able to connect to the network and use the phone to make calls and send messages. Scroll down and look for About Device or About phone, About tablet. Tap on it. Tap on Check for updates and if any updates are available, then download and install the updates. Once the software of your phone is updated, your phone will restart automatically and after the restart, it will try and connect to the available network. Once the network is connected, check if the problem is fixed. There are times when the device’s IMEI number may have been nulled or there may be a problem of unknown IMEI number which can lead to a no signal or no service problem. You must check if your IMEI number has been nulled or corrupted. And if the problem lies within the IMEI number, then it is imperative to restore the null IMEI. Head into the dialer of your phone and enter *#06# which will bring up the IMEI number of your device. If the result shows as Null then your device’s IMEI number has been corrupted and you must take necessary action to resolve this problem. To fix the problem, dial *#*#197328640#*#* from the dialer of your device. Alternatively, you can also dial *#197328640# . On dialing this number, you will enter the command mode on your phone. Make sure you select Common on your device. Now choose the first option which must be Field Test Mode (FTM). If you find FTM to be On, then turn it Off. Once you switch off FTM, press the Menu button and your IMEI number should be restored. To switch off FTM, you must press option 2 using the key input. Remove the battery of your device (if you have a removable battery) and remove the SIM card of your device as well. Wait for two minutes and reinsert the battery but do not put the SIM back yet. Switch on the device and from the dialer, type the number *#197328640# once again. Head into the Debug screen menu and tap on Phone control. Next, you must tap on Nas Control and then RRC. The last step is to tap on RRC Revision and tap on Released. After completing these steps, power off your phone and reinsert the SIM card. Power on your phone and check if the problem has been fixed. If none of the above solutions have worked, reset your phone to factory settings. When you reset any device to factory settings, you bring the software back to the same state as it was when the phone was taken out of the box. This step deletes all the data from your phone and it also deletes all apps that may have been downloaded to the phone. So you must create a backup of all the data before you reset the device to factory settings. Android devices have a backup option from within the Settings menu as well if you would like to create a backup using this option, you can do so. You can check or uncheck the option to create a backup from this screen. Towards the bottom of the screen, you have the Factory Reset button. Tap on it to reset the phone to factory settings. Once the phone is reset to factory settings, it will automatically restart. Allow your phone to connect to the network and then check if the problem has been fixed or not. What to do when I get “error while searching for network”? Some of our readers asked for a solution for this error that comes up on their screen when the phone has no signal. Since we are covering all no signal issues, let us check how to resolve this problem as well. 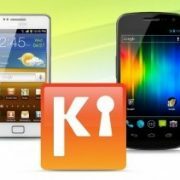 The solution is unique to this issue and it seems to have worked for most of the Android phones. Staying on the same screen, press and hold the Power key and the Home key of your device till the phone powers off. Now press and release the home button and the power button together. Do this 10 times. After doing this, press and hold the Power and Home key together for at least a minute. By doing this you will be able to drain all the static charges present inside the circuits of the phone. Now reinsert the battery after all charges have been drained and power on your device. After restarting the device, let it connect to the network and check if it works as expected. Try to make calls and send messages to ensure that the problem has been fixed. What to do if I am using custom ROM and I get this error? 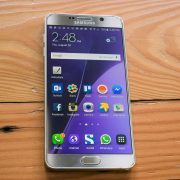 The no signal error has been noted on some devices with custom ROM. In a case like this, it is advisable to return to the original ROM and check if the problem is solved. Then you will know that the ROM is not suitable for your device. The original ROM can be installed using the recovery screen. The process will delete all data and remove apps from your device so make sure that you create a backup for all important data that you do not wish to lose. You can find the ROM you need by taking the help of your device’s model number which is in the About Device section in the Settings menu. 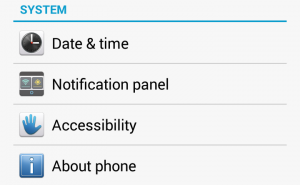 Once you have the model number, download the stock ROM for the device ensuring that you choose the right ROM. The ROM will be in the form of the .zip file. Make sure you do not extract the file. Also, download the GApps for the ROM that you are downloading. You can save these to your internal storage or to the SD card. After downloading the ROM and GApps, switch off your device. 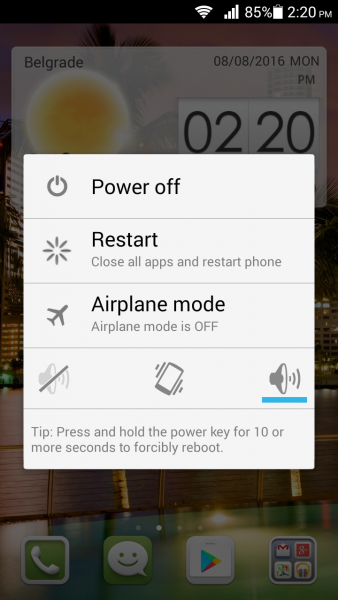 Now press and hold the Power and Volume Down buttons together till you see the recovery options on your screen. You will see a lot of options, and you must choose the first one which is Install. Choose from the next prompts which will ask you to locate the file on your device. Once the file is located, choose the option at the bottom of the screen to Confirm Flash. The stock ROM will be flashed to your device. Once the process is complete, you must delete the cache and choose to wipe the data and reset your device. 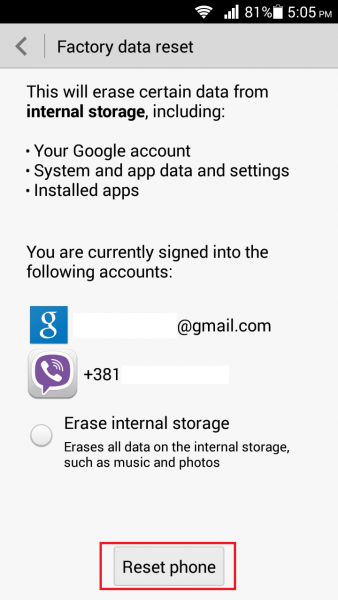 This is one of the ways in which you can install the stock ROM for your device. There are other ways of doing this and you can choose a different way of doing it depending on how comfortable you are with installing ROMs to your device. What should I do if I think one of the apps can be causing the problem? If you have a feeling that one of the apps that you downloaded to your device can be causing the no signal problem then you must check if your device works in Safe mode. If your phone or tablet works fine in Safe mode but if the problem reoccurs when it is in normal mode, then an app is definitely causing the problem because Safe Mode disables all third-party apps. Press and hold the Power button till you see the Power options on your screen. 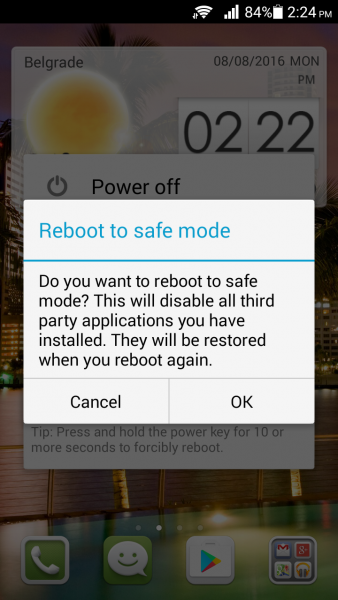 Press and hold the Power option and you will get a pop up which will ask you if you wish to restart your phone in Safe Mode. Press OK to confirm and proceed with the reboot. Once the device is rebooted, you will see the words Safe Mode on the screen. Check if the phone works properly in Safe Mode. If the issue is resolved then the problem may lie in one of the apps. You can reset your phone to factory settings so that all the apps will be deleted. On the other hand, you can restart your phone once again to enter the normal mode and uninstall the apps that you think may be causing the problem. After every uninstall, check if the problem is resolved. 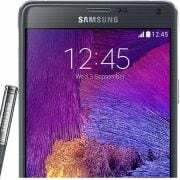 All these solutions can work for all Android devices such as Samsung Galaxy, Galaxy Note series, HTC One, LG etc. that have a no signal problem. If these solutions do not work for your phone or tablet then you must consider taking the phone to a store in which you’ve purchased it, or your carrier.